Land Ahoy, established 2006, is a custom built tattoo and piercing studio, situated at our new premises at 118 Sauchiehall Street, Glasgow. For a clean, hygienic parlour, with some of the best tattoo artists in Glasgow, we ask you to pop in and say hello! Have been getting tattoo’d by kenny for years and his work as always has been excellent. The new Land Ahoy is an excellent parlour great surroundings great atmosphere and good banter , well worth a visit!! Walked in off the street having never been in before. Kyle did an amazing job & the place is so relaxed. i’m in love with my wee skull! can’t wait to come back & get another 🙂 thanks again Kyle! After a bit of a nervous wait on my other half getting his second tattoo from Kenny, which was excellent! I got mine!!!!! Delighted. Would most definitely go back. Everyone very professional and chatty and cleanliness was of the highest . Thanks again Kenny! Had my first ever tattoos done here last Wednesday, was made to feel welcome and Roberto was fantastic! In love with my 2 new pieces. Place was spotless and I left knowing I had been in good hands. Definitely returning in the coming weeks! Few friends recommended the place and now I’ll be doing the same! Thanks again Roberto you were class! see you soon. Wouldn’t dream of going anywhere else! most relaxing atmosphere ever and everyone is super friendly. been tattooed by Kyle & Roberto now & they’re both totally brilliant 🙂 encourage anyone who fancies decorating themselves to jump in here! 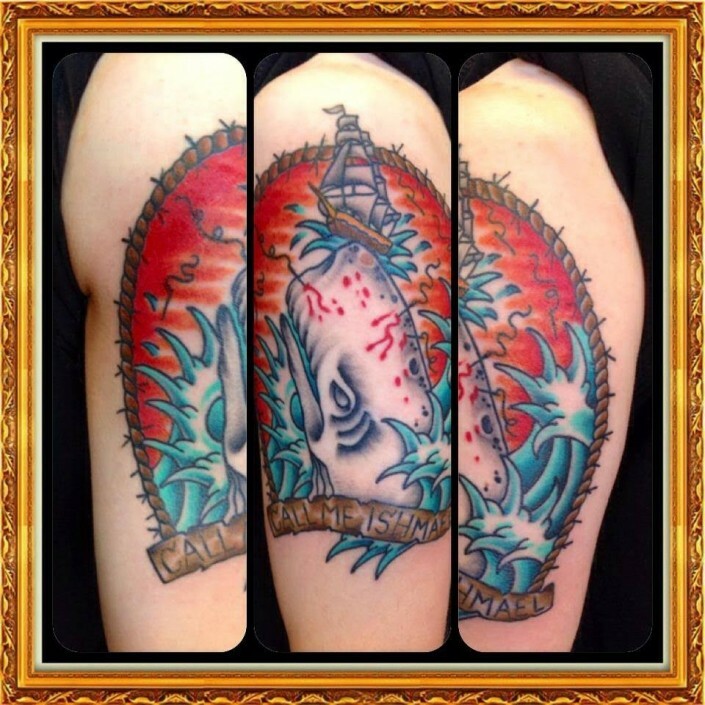 Kyle is a versatile artist, covering many styles in both black & grey and colour work. With several years experience, from running his own studio in the east of Scotland, to working custom studios in Glasgow, he has a wide range of clients with many different tastes. Preferring a modern neo traditional style, as well as experimental illustrative ideas, he likes to use influences from his love of cinema, sci fi, steampunk and horror wherever possible. Tattoo artist and shop owner, Kenny Mitchell, started his career as a graphic designer and computer animator for British Aerospace before turning his hand to his first love, tattooing. After completing his tattoo apprenticeship he began tattooing around Scotland. Kenny then moved to the USA where he re-apprenticed under strict American guidelines. He worked in award winning studios around the USA before returning to Scotland in 2003 where he has been tattooing since. Kenny’s work has been featured on the BBC, ITV and in many tattoo magazines and was featured in a 5 page personal profile in Skin Deep magazine. Kenny enjoys all styles of tattooing and welcomes both custom work and clients own designs. With many years of experience under his belt, Kenny can put clients at ease while providing a professional top quality tattoo in any style. Ross can turn his hand to any style. He has an amazing eye for precision and detail, giving clients a clean, solid, professional tattoo. He is passionate about his art and aims to provide clients with perfect unique custom designs. He has a calm and approachable manner, putting customers at ease. Ross enjoys all styles of tattooing and welcomes both custom work or clients own designs. Sara joined the land ahoy team in 2016. After owning her own studio in Saltcoats, she moved to Glasgow. Sara studied art and visual communications at college before turning her skills to tattooing. She is comfortable with all styles of tattooing but has a huge passion for floral, animal and occult themed tattoos.